A sunny day for the presentation! 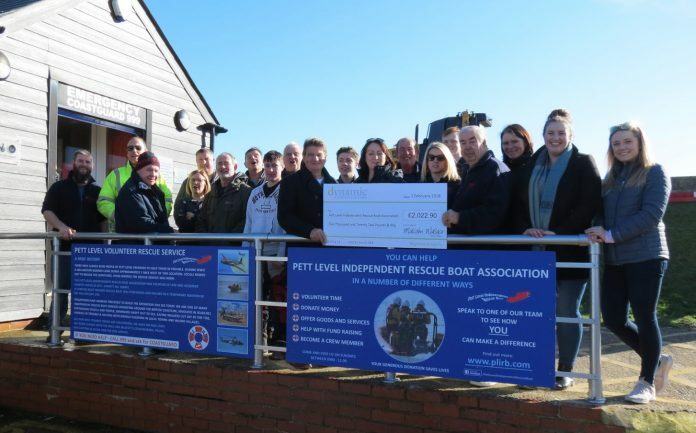 Rye based international events management agency, Dynamic Conferences & Events, has raised over £2,000.00 for the Pett Level Independent Rescue Boat. The Rescue Boat plays a crucial part in maintaining the safety of our local coast and its volunteers do amazing work searching for missing yachts, rescuing walkers who are stranded by incoming tides, finding children who have gone missing in our local waters and rescuing wildlife that has become contaminated by pollution. This charity is completely dependent on public donations and are in need of a new lifeboat launch vehicle, which they are now closer to being able to purchase with these funds. Dynamic Conferences & Events took part in the Dragon Boat Race at Bewl Water to raise money for the Pett Level Independent Rescue Boat. They launched a successful online crowdfunding page as well as organising a local pub quiz night with prizes given by the local businesses and the agency’s international partners. These charitable campaigns resulted in raising over £1,000.00, which Dynamic Conferences & Events then match-funded. One of the Dynamic Events team – Jo Stapley – is an active volunteer with the Rescue Boat. The team presented a cheque for a total of £2,022.90 to the lifeboat crew this weekend to enable them to upgrade the equipment essential for their rescue duties. Well done to the Dynamic team. Had a fabulous night at the very well organised quiz last year. Thank you for supporting such a worthy local cause. John Minter on Old warships never die . . .
Tony lintorn on Old warships never die . . .
Michael Smith on So what happens now?